Marbella boat charter companies can be found up and down the Costa del Sol. The region is full of boats for hire that can offer everything from a quick sunset cruise of the Golden Mile to overnight excursions to Africa. But which one is the right one for you? If you're with family, you likely want to choose a charter company that is mindful of young children or kids you may have on board. A boat hire is a fantastic way to experience the beauty of the Mediterranean as you take in the rugged coastline of the Costa del Sol. Take some time, however, to research the right trip suited to your needs. Not all charters are equal as you may soon discover upon reaching out to some of the local operators. One this is for sure, if you love the sea, or just want to have a few hours with family and friends to experience the Mediterranean, Marbella can guarantee that your family is well entertained. You can find charges for hire in in all major ports of call along the Costa del Sol including: Marbella, Puerto Banus, Estepona, Benalmadena and Sotogrande. In this section, we've highlighted those charter companies that have been recommended by families on the Costa del Sol or those that have a genuine focus on working with family residents and visitors to the area. We recommend you contact them directly to get a better feel for their services and approach. 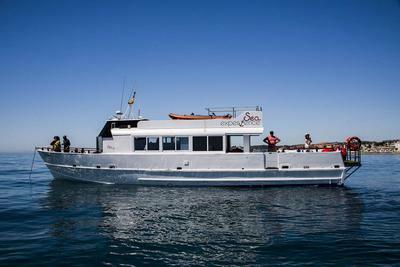 Experience Box Spain offers families on the Costa del Sol boat charters and accompanying services for groups of all sizes. From birthday party boats to full sized yachts for weddings and corporate parties, you'll find a wide range of service levels from this recommended provider. Marbella Charter is an experienced boat hire company which can organise sailboats, aquatic activities and even catering for events of any size. They also offer great packages for families interested in fishing, attending regattas or dolphin watching. Leixury Animacion is a unique events company offering yacht charter services to international families on the Costa del Sol. Owned and operated by Pepe Nieto, you'll find that this company is friendly and flexible to your unique needs. Have a question or recommendation about boating in Marbella or the Costa del Sol? Best Attractions and Boat Rental Service in Marbella? Is there any boat trips from puerto banus to tarifa?